On Tuesday, April 24, the Chadron Middle School 5th graders enjoyed participating in many activities during the 9th Annual Upper Niobrara White Natural Resource District Conservation Day. The students learned about how to conserve water and how harmful pollutants can be to our water supply. They created an edible aquifer and enjoyed the fun snack. The other stations dedicated time to teaching students about how to use a GPS, how birds feed their young, noxious weeds, and different types of soil. The water rockets station was a hit. By experimenting with levels of water in a pop bottle, students created their own water rockets and competed against their peers to see whose rocket traveled the farthest. This station also gave the students a chance to cool down by getting sprayed with water! The 5th graders want to thank the Upper Niobrara White NRD and all of the presenters for providing such a fun, educational day! Spring Flowers...Where are the Showers? Chadron Middle School Students in the CMS After-School Program took time on Monday afternoon to work on a campus beautification service project. 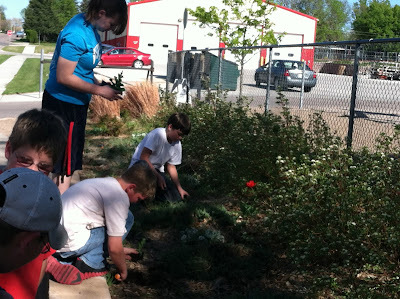 Despite the hot day and the dry conditions, students planted flowers in front of the school under the guidance of the CMS After-School Program staff. Now we need to hope for some rain so that new flowers can take root. 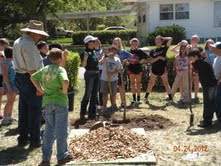 The After-School Program has done several service projects over the course of the school year that have focused on campus clean-up and campus beautification. We all appreciate their efforts in making Chadron Middle School look good on the outside as well as on the inside. I also want to congratulate all of the CMS students that took NHD projects to State this past weekend and thank them for being good ambassadors for CMS! 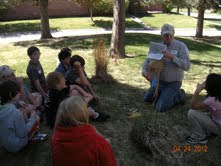 On April 24th, 5th grade students from CMS will attend Conservation Day at Assumption Arena in Chadron. All 5th grade students and core 5th grade teachers will attend the event for the entire day. Students will need to pack a lunch for the day, or place an order for a sack lunch through their homeroom teacher. A letter with more details will be sent home with 5th grade students in the next couple of weeks. On March 28th, Chadron Middle School hosted its first scholastic competition in more than 20 years! The entire middle school faculty, as well as a few faculty members from CHS and the elementary schools helped with the event. In total, nine schools: Chadron, Mitchell, Gering, Bridgeport, Hay Springs, Gordon-Rushville, Crawford, Banner County, and Hemingford competed in the academic contest. Chadron’s 7th grade team took 2nd place and our 8th grade team took 3rd. It was fun day and we hope that it will become an annual event. Thank you to the parents that set up the hospitality room and those that were able to come watch a few of the contests. Thank you to all of the parents that returned the school climate survey that was sent home with your students in March. I appreciate the feedback that we received and we will use that information as part of our school improvement efforts. 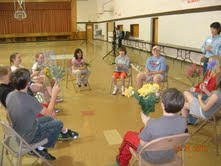 CMS had our annual Student Health Screening day on March 30th. Overall, the day went very well and students were given basic hearing, vision, dental, and blood pressure screenings. Students’ height and weight were also taken. Thank you to all of the community partners that helped throughout the day. Testing is well underway, with the NeSA Math, Reading, and Science tests completed. We will continue with testing through the first week of May as our students begin to take the NWEA –MAPs tests in Reading, Language Arts, Math, and Science. Although the testing schedule is long, please know that we use the results to make instructional decisions that have an immediate impact in the classroom. Thank you for encouraging your students to do their best on these assessments and for ensuring that your students are well rested, well nourished, and present at school every day, but especially during the testing window. 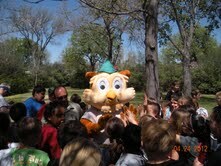 The testing schedule is posted at www.chadronschools.org under the CMS tab and at http://mrdressel.blogspot.com . Remind 101 is free online software that allows Mr. Dressel to send school related information to parents via text message. If you are interested in receiving text messages from the principal, please text the message @cmsprinc to (925) 304-6118. Twenty-one parents have signed up so far and we hope that more will join this service.